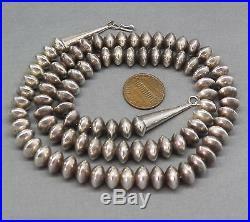 Nice Vintage Native American Sterling Silver Saucer Bench Bead Necklace. Measures about 23" with beads about 3/8" in diameter. Strung on chain with cone ends marked with a rising sun symbol above Sterling mark. Hard to see mark without a loupe. Beads are strung losely enough that there would be room to hook a pendant between them. These charges are the buyers responsibility. 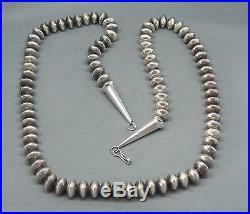 The item "Nice Vintage Native American Sterling Silver Saucer Bench Bead Necklace" is in sale since Sunday, April 12, 2015.